If you are tired of sweltering in the heat, you may want to install air conditioning. While the best kind is that which is directed into every room when needed, there are many different kinds and it is easier to fit something like a reverse cycle a/c into an older home rather than installing ducting. You’ll need to contact a qualified electrician for installation and repairs. As electricians who have serviced the Perth, WA area for many years we are fully licensed and qualified to install any kind of air conditioner. We can advise you on the best placement so that cool, refreshing air will circulate around the room or the home with the utmost efficiency. We can also offer air con supply, so you won’t even have to venture out to the shops to get your home cooled. Your enjoyment of life will be restored once you don’t have to sit in the heat all during summer. Many people can’t eat or sleep properly in heatwave conditions such as Perth often has in summer. This makes them tired and irritable for the whole of summer when they should be enjoying themselves. Installing an air conditioner could be the best thing you ever did. You won’t have to dread the coming summer when you can take the sting of it out and have cool air flowing around your home with the simple press of a button. Our electricians are friendly and efficient, treating your home like their own and cleaning up any mess they make during the installation. 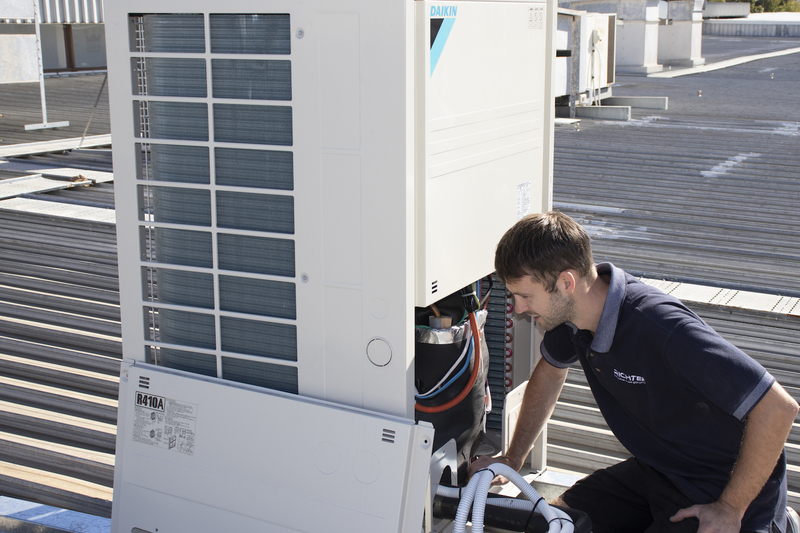 They’ll be able to advise you on the care and maintenance of your new cooling unit and if you’ve never used one before, they’ll even show you how that remote control works, so you can adjust the a/c to suit your needs. For most such devices, all you need to do is clean the filters once or twice a year and keep long grass and bushes away from the fan and motor outside, if there is one. However, the electrician will need to come and check it out on an annual basis, especially if it has ducting going to each room. Over time, these can degrade and tear, or insects and rodents can get into the ceiling cavity and damage it. This will force the unit to work harder than it should to cool the room. It will also cost more to run, so it’s important to ensure everything is in good order. Our electricians are trained to install and maintain air conditioners so you won’t have to worry about a thing. Simply call us to make an appointment. The best time for this is before the hot weather hits, so you won’t have to swelter while waiting for us to come.